No copyrighted images can be used in anyway – please refrain from pop-art as others have experienced legal issues in the past. You own the copyright to your work, but we will have the right to use the winning design on T-shirts as well as other Robin Hood Festival material for as long as we like. Please use vector images and upload .pdf or .eps files for best image quality. If you would like feedback or help, indicate so in the comment form and we will guide you through. You can also contact us at robinhoodfestival@gmail.com. Some judges have said they prefer the Robin Hood Mark to be on the shirt, but this is not a requirement. Said mark is in the template to the right for download. 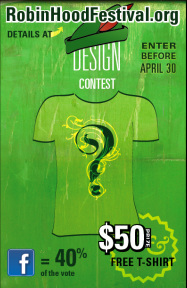 Enter as many designs as you wish, pay only once. All funds go towards the Robin Hood Festival.